The CHIBI-Engine is a 2D game engine that allows users to create all kinds of 2D games. The engine in written C++11 using Direct-X10. A game is build up with scenes that contain game objects. 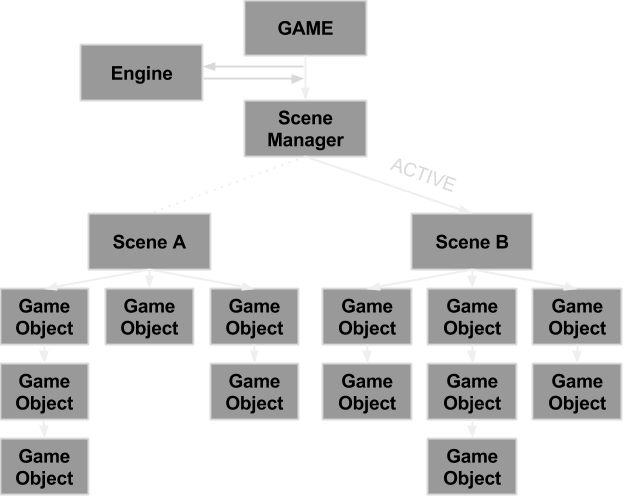 Every object in the game, whether its a Hero, a pickup, a tree or even a rectangle on the screen, inherits from the base GameObject class. This way every object is treated equally and can be stored in the same containers, be used as parameters in the same methods and be stored in a scene. (eg. c# Object). You can easily create new objects by creating a class that inherits the base GameObject class. All you have to do is add code to the virtual Initialize, Update and Paint methods. You can add an object as a child to another object to create child-parent structures. By doing this you can make sure that they will be linked both physical (inherit transformations) and code-wise (children are always painted and updated after their parents). This way you can created all sorts of dynamic entities. Every scene has its own set of GameObjects, and manages everything from updating to painting of these objects. If a GameObject has child objects, it will manage these. This way everything gets painted and updated automatically. If you want to see the engine in action, take a look at the KEEN++ project page. I made this remake of ID softwares Commander Keen 4 completely in the CHIBI-Engine. You can also pay a visit to the Git-hub page. Here you can find a simple example project that showcases most of the features of the engine. There is also a empty template project that can be used to create your own games with! To view the documentation explaining every class, method and data member in the engine, click here. The level editor that comes with the CHIBI-Engine allows users to create levels for all their games with ease. Whether it's a side scrolling platformer or a top-down racing game, The editor is able to aid you in your level creation process. With the editor you can create tile-base levels and add interactive game specific objects to them. The engine parses the level files automatically so you don't have to worry about loading them into your game. The level editor also has a built in collision shape generator. 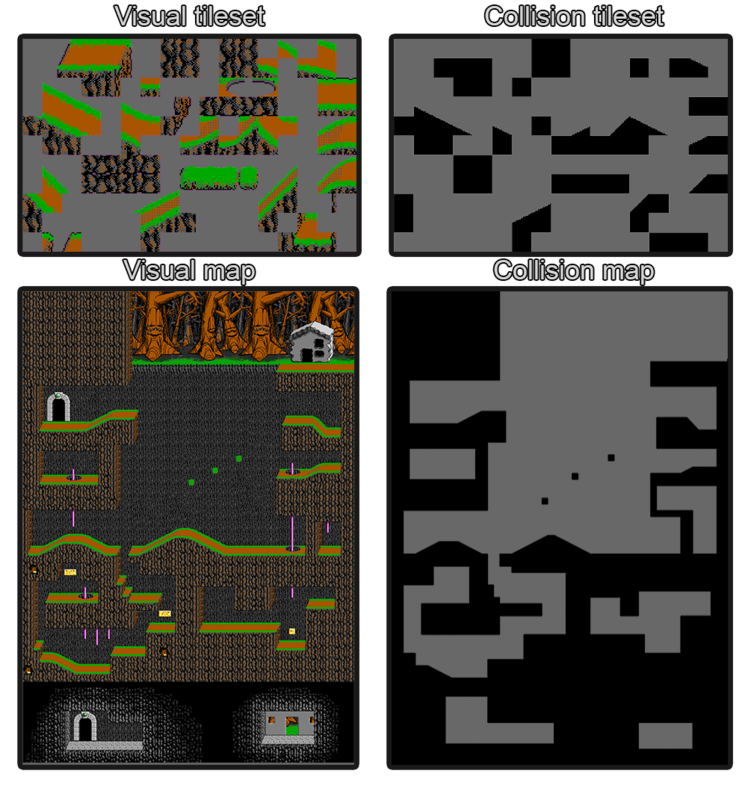 By providing a black-white collision tileset, the editor will automatically build a collision shape to use in your games. This way all you have to do is create a level that looks the way you want. You don't have to go over the entire level again to define the collision shape. The animation editor helps you to create 2D animations sampled from a spritesheet or multiple images. The editor also has a preview screen so you can see what the animation looks like after every change. A animation file can contain multiple animation sets, each containing their own animations made up out of key frames. A key frame contains data concerning which part of which spritesheet has to be played for a given time. By using this editor the animation creation process goes much faster then it would if you'd write all the animations manually. Click on one of these features to roll-out additional information and example code. Write data to a debug console. All managers output warnings automatically to notify if something fails. Save console to a text file to review later. Different levels of messages (Normal, Info, Warning and Error) each with a certain color so errors can be spotted immediately. Invoke pop-ups to alert player / developer. In release mode, the program will show a pop-up message and close. In debug mode, the program will break at the point of assertion and write the message to the output window. Trigger pop-up messages within a try-catch structure. // Run the Fire method to show the pop-up window, and potentially close the program. // You could save backup data before shutting down in this catch block. Check combination of keys/buttons that are pressed at the same time. Ability to remove input messages so they are only registered once (easy when you have UI screen rendered on top of each other). You can easily write scripted actions using c++11 lambdas (or functors) and add them to the Action Manager. Run an action at anytime from anywhere in your code with a single command. Collision detection and handling in only 5 lines of code! Add objects to the collision manager and give them a tag (‘Hero’, ‘Mob’, ‘Pickup’, ...). Let objects check for collision with objects with a given tag (‘Hero’ checks for collision with ‘Pickup’). Script or code the OnHit event using c++11 lambdas. You can also manually check for collisions with objects that are added to the manager. You can also use Ray casting on either all objects in the scene, all objects with a certain tag or just a single object. A XML file contains all animation sets of an entity. Every key frame contains data about the part of the texture that needs to be rendered, the texture that the frame is taken from (possibility to use multiple textures for 1 animation) and a length. Play animations with just one command. Example of adding a texture to the manager. Follow Camera: Center of an object. Limit camera: Make sure the camera doesn’t leave a certain rectangle If the screen is bigger than the limit rectangle, the rest will be blacked out. This allows the user to create multiple rooms in the same map, and make sure the player doesn’t see them until he’s allowed to. Inherit the base Camera class and create your own dynamic cameras. Every timer is ticked automatically and can be paused, stopped and restarted with a single command. Timers can be set to pause when the game is paused. Different kinds of timers to suit every need. Countdown timer: Start at a given time, and count back to 0. If the timer hit’s zero it automatically stops. CountdownAction timer: Same as the countdown timer, but an action is fired when the timer hits 0. StopWatch timer: Starts at 0 and counts up. The current time can be retrieved at any moment. Create a UI with ease. Create different UI elements and add them to the UI. Base HUD elements present : Text, Bitmap, Rectangles, Values (auto updating pointer values). Interactive UI element: Button, Text box, Scrollbar. Create your own HUD elements by inheriting the base HUDElement class. Not only for games but also for tools like Level Editors. Add game objects to a scene. Scaling, rotating and translating sprites on all their axis. Every game object has its own scale, rotation and position in local space and global space. Since I made this engine mostly in my free time, combining it with my school assignments, I haven't been able to focus 100% on it. Therefore the engine is far from finished. I have a list with a couple of features that I would like to add in the future.